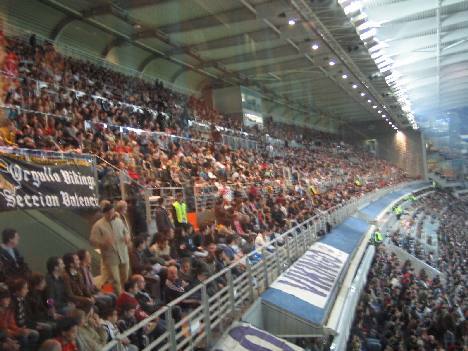 This daytime Real Madrid photo gallery is from Spains La Liga match between Real Madrid and Valladolid in 2008. Although at the time of the game Valladolid occupied 6th spot in the league and Real Madrid were first the game turned out to be a 7-0 rout! Ed: As an Atletico fan one must confess to have enjoyed the result somewhat less than the other 79,999 people in the stadium! 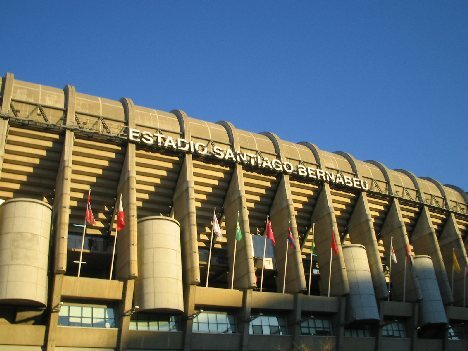 Immediately after climbing the steps out of the metro (of the same name) one is confronted by the Real Madrid stadium and the matchday atmosphere. The flags that adorn the stadium are of every club in La Liga in that season. 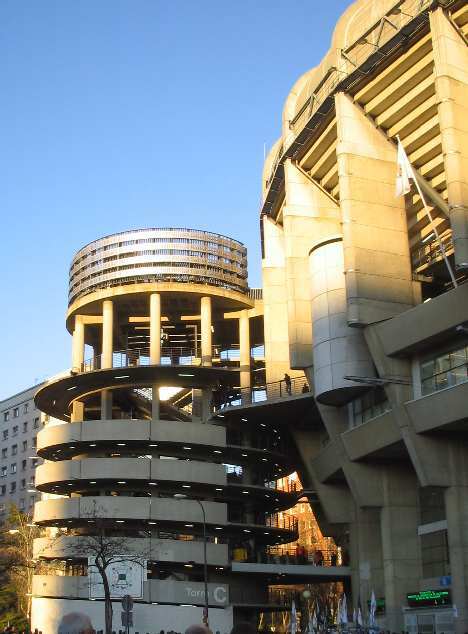 To gain access to the upper tiers (Antiteatros 3 & 4)of the Santiago Bernabeu one must go up one of the four towers located in the corners of ground. If the escalators are working then theres no problem... however this tends to be a rare occurence and more often than not access is via the central stairwell. 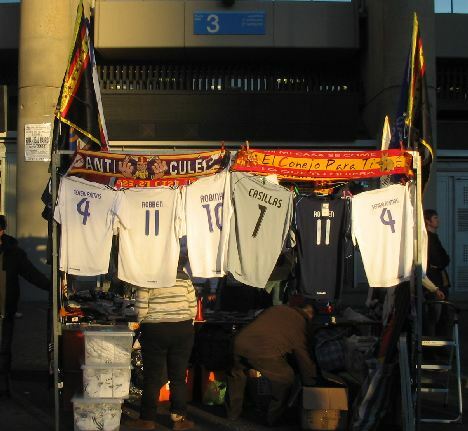 Of course the matchday experience wouldn´t be complete without the unofficial street hawkers. "Anti Cule" means Anti Barcelona... of course the same stands in Barcelona sell the opposite version of the same scarf "Anti Madrista". 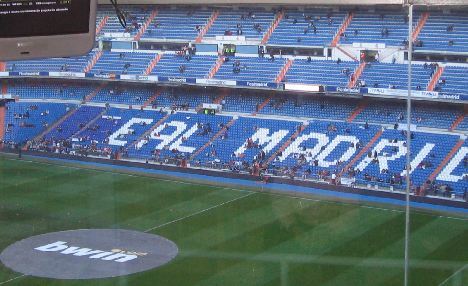 The lower tier of the west stand, in front of the players tunnel, has another clubs name marked out in the seating "Eal Madrid". Immediately behind this stand is the Museum and trophy room which can be visited during the Real Madrid stadium tour. 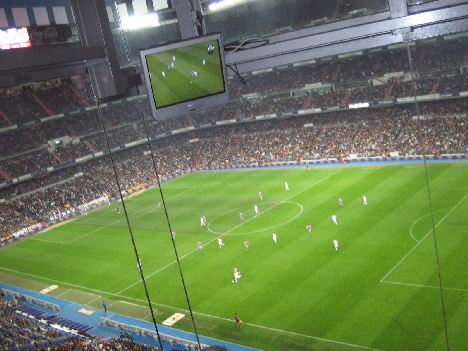 As an Atletico Madrid fan there was no way I was going to pay to watch Real Madrid but a friends "freebe" to sit in the executive box couldn´t be turned down! 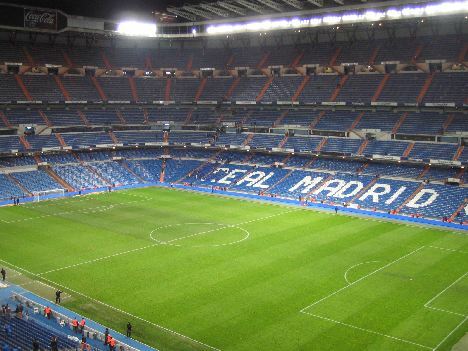 Its really not the same singing Anti Madrid songs when no one can hear you! 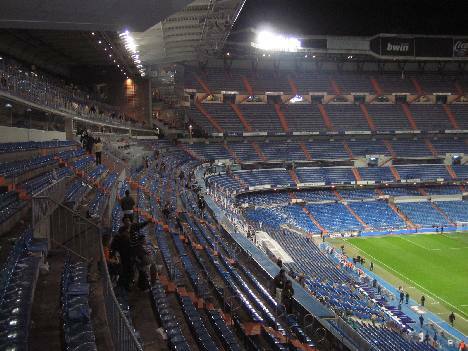 The "died in the wool" Real Madrid fans had plenty to cheer about, seven goals in fact. 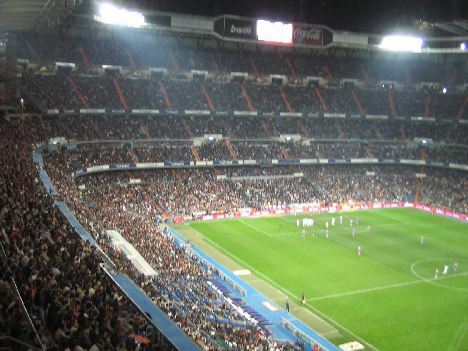 The small section behind the goal in the "Fondo Sur" is given over to the "Ultra Sur" and is where 95% of all singing occurs. With the recent opening of the new Tier as part of the "Lateral Este" (East side) 5,000 additional fans can be accomodated in comfort. As the majority of the new seats went straight to fans that had been on the clubs season ticket waiting list these guys tend to be very animated... however they do at least cheer the team on. ... and when those 5,000 seats have been cleaned there are only 75,000 more left to clean!!! We trust you have enjoyed this Real Madrid photo gallery... if you want something similar see ...more Real Madrid photo galleries from the 2008 Champions League!